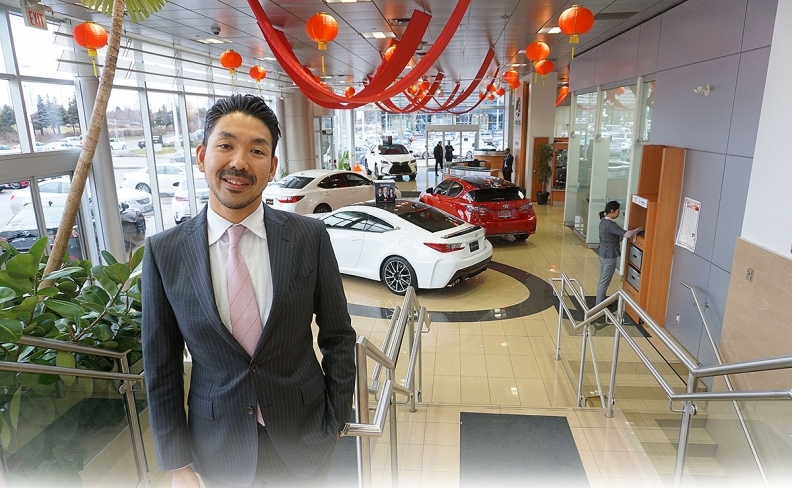 Toro Miyahara, pictured in Don Valley North Lexus, runs the Canadian arm of the Japan-owned dealer group founded by his grandfather. Does Don Valley North Toyota have it roots in Japan? It’s a Toyota dealership, so obviously. So does Mississauga Honda. But Oakville Volkswagen? Mercedes- Benz Barrie? They also have their roots in Japan as both belong to a dealer group owned by a Japan- based parent company. The VW and Mercedes-Benz stores are just the latest additions to the 10-store Weins Canada group, which traces its Canadian roots back to 1973. That’s when the late Kanji Miyahara, the outward-looking founder of Yokohama Toyopet Company Ltd. in Yokohama, Japan, opened Don Valley North Toyota in the northern suburbs of Toronto. For many years Don Valley North’s Canadian face was Vice-President of Operations Dave Lalonde, though there were always Japanese managers in the background. Valley North Toyota Ltd. The family moved back to Japan in 1988 and Toro completed his education there. After graduating in economics, Toro worked at Toyota Motor Corp. for seven years, before joining the family business in Canada in 2009. He assumed the presidency of Weins Canada in 2011. But that changed in Canada in 2008, when the group established Don Valley North Hyundai. Since then, the roster has added Audi and Volkswagen in Oakville, Subaru and Mercedes-Benz stores in Barrie, and most recently Mississauga Honda. The 10 stores in Canada are barely five per cent of the parent company’s total dealership portfolio (191), yet the Canadian operation accounted for 16 per cent (11,680 out of 74,426) of group sales in 2015. Toro calls Japan one of the world’s most advanced markets because dealers there have learned to survive in a new-car market that has halved in size from its early-’90s peak of six million. It’s not the economy, he says, but rather changing consumer attitudes. Younger urban buyers, especially, don’t see the need to spend money on buying, insuring and parking a car when Japan has a great public transportation system, and car sharing or rental are other options. Dealers there have become masters of fixed ops. “One good example I always give is the fixed absorption rate,” says Toro, which is the percentage of dealership expenses absorbed by the gross profit generated from parts and service sales. “That was about 60-65 per cent 25 years ago for the average dealer, and now it’s near 100 per cent. Other aspects of Japanese culture also infuse the Canadian operations. Miyahara also believes Weins Canada goes further than other dealer groups to centralize as many aspects of the business as possible. The annual kick-off meetings begin by bringing all staff from all the stores together, before breaking out into their store-by-store meetings. “We really try to connect and share even though it’s different brands and different stores.”Likewise, when it comes to acquisitions Weins looks for stores with a compatible mindset. “We want to make sure the management and the people all share some kind of common culture with us. “We really want to make sure we hire the right people and invest in those people,” Miyahara says.